Welcome to the September 2015 edition of Gifted Matters, the newsletter for CGA members. Each edition features articles for parents, teachers and the CISD community at large. Our September edition is open to the public. Future editions will only be available to our 2015-2016 CGA members. Not a member? See the membership article below to join! Welcome to a new school year! We hope you had a great beginning to the 2015-16 school year. Here at CGA we are planning some great events for you through the year so be sure to check out the newsletter each month. (If you are not already a CGA member this year, be sure to join / renew as the future 2015-2016 editions of Gifted Matters will be only available to members). New school year has started and it’s time to renew / join CGA for the academic year 2015-16. All memberships run concurrent with the school year so renew now! Did you know that when you join or renew your membership in addition to supporting gifted education in Coppell you get a number of benefits for you and your family to enjoy? This year CGA is proud to provide our members with a bigger benefit. When you join CGA for the 2015-2016 school year, you will receive a FREE parent-level membership for TAGT (Texas Association of Gifted and Talented)! Early Bird Discounts Expiring 10/16 – Join or Renew now! Educators ! Join or renew now to avail the early bird discount of free membership to CGA. Click here for the details of membership. CGA Speaker Series : Join us for an informative session with CISD’s Director for Advanced Academics, Deana Harell. Her topic will be The State of Gifted Education and Advanced Academics in CISD 2015 and it will be held on September 10, 2015 at 6:30 p.m. in the Lecture Hall at Coppell High School. This session is open to everyone, and there is no admission fee. CGA Speaker Series: Recognizing and Nurturing Talents of High Ability Kids” – Susan K. Johnsen, Ph.D. Please join us to hear Susan Johnsen talk about this topic on September 24, 2015 at 6:30 p.m. in the Lecture Hall at Coppell High School. Event is free for CGA members; $5 for non-members. Click here for more info. TAGT Family Night: Mark your calendars for October 7th as we have a great TAGT Family Night planned for you. More details will be posted soon but it will be an event you would not want to miss. CGA is offering scholarship opportunities for attendance to the TAGT Annual Conference being held in San Antonio, TX from December 2nd-4th, 2015. Coppell DI had a very successful year with 24 teams in regional tournament, 5 advanced to states and Mockingbird Elementary “brain Blasters” to global finals. 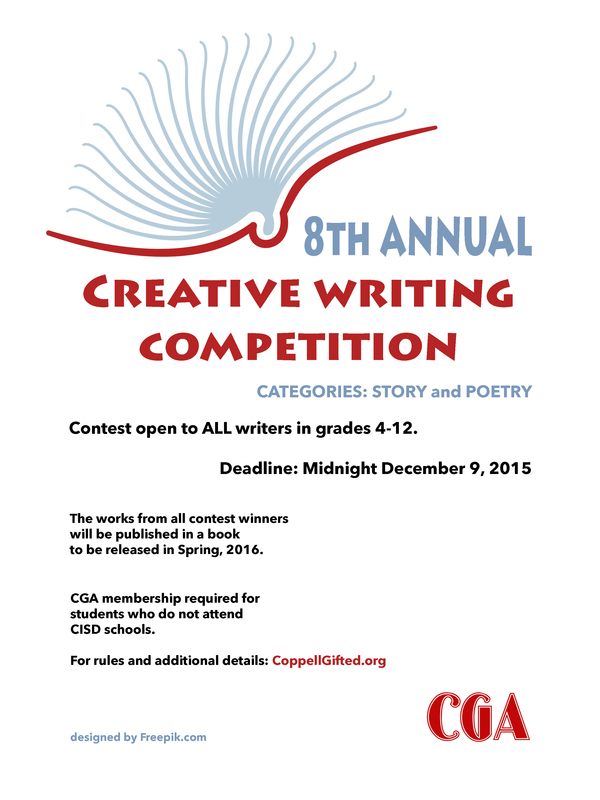 Check Coppell DI website for more details. More information on the program can be found here and at a DI information session at Mockingbird Elementary Cafeteria on Thursday, 17th September from 6.15 to 7.30 P.M.